The lady who believed… Remember back in 1980 with a new president, a recession, interest rates on home purchases 16 – 17%. This was not a good time to start a real estate career in Chicago, but Joyce did!! It was tough, not too many experienced agents were selling and not too many clients were buying in these conditions. But the “I can” lady did sell and sell and sell and in a short time became leading sales agent in an office with 40 + agents, and within a year one of the top sales agent in the southwest region of Chicago. Following her husband’s job transfer the family packed up and moved to Florida where her experience under fire led to a position as assistant manager, then branch manager and on to the relocation director for nationwide organization. 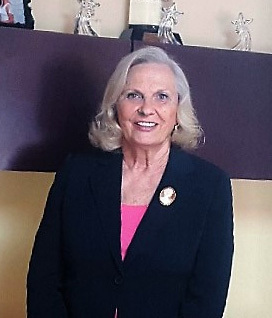 By 1991 Joyce was ready to start her own company and she opened the Clearwater office of Camelot Inc. Realtors®. The theme for her company was and remains after 25 years “WE SELL DREAMS”. She has over 25 years in the foreclosure and bank owned sector of real estate. Joyce also believes in giving back. She has served on various real estate committees including teaching the Code of Ethics for many years. She holds her GRI and CRB designations. She has served as the president of the Greater Clearwater Board of Realtors®. In addition to production awards she received Realtor® of the Year and Circle of Honor. Joyce resides in New Port Richey surrounded by family which includes husband, children, grandchildren, great-grandchildren and two dogs.